Cross-posted from the SPUR blog. Gabriel Metcalf and Ratna Amin are SPUR’s executive director and transportation policy director, respectively. For a group like SPUR — one that works to promote transit, walking and biking as primary forms of mobility — there’s no question that a transit strike is a major setback. It instills in people the sense, consciously or unconsciously, that they cannot count on transit being there when they need it. People who don’t have the flexibility in their jobs to work from home, or who need to get their kids to school, are getting the message that they can’t rely on transit for daily trips. All of this is deeply unfortunate. What does it mean for our broader transportation agenda when something like this happens? Fully 63.5 percent of the 400,000 daily trips on BART are to or from the San Francisco downtown area, and 50.1 percent of all BART trips go through the Transbay Tube, according to data from BART’s monthly ridership reports. On weekday mornings it carries about 21,000 people per hour to the west side of the bay. By comparison, the Bay Bridge carries about 24,000 people per hour in the same direction. Both systems are currently very congested for much of the morning and afternoon peak hours (though not all the cars on the bridge are full), according to a Bay Bridge congestion study. Although only about 5 percent of the region’s workers use BART during the morning peak, taking that 5 percent off the road brings tremendous benefits to our roadways and other travelers. With BART’s closure, we see how moving that small number of people off transit and onto roads causes “chaos” through much of the region. Many of the highway corridors that BART serves are operating near capacity at peak hours already — which is part of why BART keeps breaking ridership records. When highways are operating near capacity, it takes very few added cars for congestion to become gridlock. Our region is projected to grow from 7.2 million people today to 9.3 million people in 2040 — that’s 2.1 million new people who will need to get around the bay. Auto demand on highway links like the Bay Bridge already exceeds capacity. Assuming we are not going to add more road capacity on these corridors, we actually need transit to carry significantly more people each year than it did the year before. The BART strike focuses us on the need for a reliable public transit system. And it contains some important lessons for our broader transit agenda. Losing BART to a strike is somewhat like losing BART to an earthquake. And it just so happens that SPUR has conducted an in-depth study on how to provide resilience in our transportation system in the event that we lose segments of our network to an earthquake. We need redundancy in our transportation networks. The fact that many of our systems are reaching capacity makes us more prone to system breakdowns and necessitates a larger array of mobility options that can “surge” when needed. Depending on the circumstances, we may need transit to back up our roads or roads to back up our transit — or ferries to back up both. We need buses to back up trains, trains to back up buses, and carpools to back up both. No one system is enough. The contingency buses BART mobilized this week only carry 2,000 to 4,000 passengers, and they were filled by 8 a.m. on the second day of the strike. Our existing ferries can take about 2,000 people across the bay per hour in an emergency. If the Bay Bridge and Transbay Tube were to both fail at once, it would literally take days to bring commuters back to the East Bay on ferries, as we discussed in our report After the Disaster. Caltrain and many Muni lines are already at capacity during peak hours, and both of these systems are subject to frequent delays and incidents. The places we see extra capacity today might not have it tomorrow. Caltrain only had about 3,500 morning peak riders at the time of the 1989 Loma Prieta earthquake, but it’s now at capacity with more than 10,000 morning peak riders. BART’s daily ridership after the earthquake (while the Bay Bridge was shut down) surged to the same level as a regular weekday today, about 400,000 riders. A significant phenomenon during this transportation closure, unlike previous earthquakes or strikes, is the emerging network of new mobility providers. These services can dynamically arrange carpools, help hail a taxi or driver, or otherwise get you form one place to another in a car. These providers are quickly ramping up supply to fill in where transit and other modes are failing, and they are meeting commuters in scattered locations. We don’t yet know the true capacity of these services, but it’s clear that they can provide an alternative — for some trips, for some people — to parts of the fixed-line transportation network. Private corporate shuttles, both those that serve transit stations and those that serve private employers, are another form of redundancy. These providers are responding to deficiencies in transit-service quality, frequency or coverage. If the public transit system is deemed unreliable by employers, whether due to labor disputes or other forms of service breakdown, will the appeal of private employee transportation grow? Finally, we should note that in San Francisco and downtown Oakland, BART works as a local subway service. In these locations, trips have been partially replaced by a significant increase in cycling. As the region creates more compact communities, cycling can be an important form of transportation redundancy, one that individuals can typically provide for themselves. To get people into replacement services — buses, boats, private cars and the emerging network of new mobility providers — we face a critical information design and communication challenge. Despite the gridlock caused by BART’s closure, there was actually extra passenger capacity on the first day of the strike — in private cars, in buses, on boats and on trains, some of which moved faster than single-occupancy cars. But despite 72 hours to plan for this event, and despite many people staying put, there were still four-hour commutes for some. We are in the early stages of a revolution in urban transportation that is defined by the emergence of private, flexible, point-to-point mobility providers. What the transportation advocates used to call “dynamic ridesharing” was only a theoretical possibility until new technologies emerged to make it possible. Ride-sharing services like Lyft and Sidecar are now joined by new forms of for-hire car service such as Uber, as well as apps like Flywheel that make it easier to connect traditional taxis to customers. Private shuttle companies like Bauer Limosine and RidePal also have the ability to provide point-to-point service as an alternative to fixed-line transit. All of these services have information at the core of their offering: They use technology to match people with latent capacity in vehicles, whether private cars or vehicles provided by the mobility providers. Public transit at this point is synonymous with fixed-line transit (in contrast to point-to-point service), but it too has enormous potential to improve communication with riders. In its most primitive form, this means good route information, so that potential customers can figure out where to go to catch a bus or a train, or signage that tells waiting passengers when the next transit vehicle will arrive. In more advanced forms, which we see in nascent stages on Google’s transit wayfinding app, technology can route transit riders to the most efficient systems to get to their destination in real time. Our first lesson is the need for redundancy in the transportation system; but we can only use the redundancy we have if people know where it is and can easily be matched with the right alternative method of getting where they need to be. Despite all the sources of information available today — conventional news organizations, 511.org, transit operators and social media — commuters are still taking a gamble when they decide how to make their trip during the strike. But as information technologies and alternative transportation providers evolve further, at least some of the information problem may be improving. While these new services are in their earliest stages of development, and we expect them to evolve and grow over the coming years, their presence raises major questions about affordability and access: The fixed-line services are public, and subsidized, while the point-to-point services are private and not directly subsidized. The resilience of the Bay Area during a regional transportation closure is also about the resilience and planning of individual employers. Companies with robust employee communication systems or existing transportation demand management programs have an advantage. Employers located near multiple transportation systems also have an advantage, because they are able to give their employees choices in how to get to work even when one system isn’t functioning. The growing ability to work from home is a type of resiliency. We don’t have numbers on this yet, but it appears to us that part of the reason that life is going on more or less as normal in some ways is that many, many people are staying home. The cultural changes enabled by the Internet and all of its associated technologies are simply much further advanced than they were in 1997, the last time BART workers went on strike. While there is a debate to be had about the pros and cons of having employees work remotely (from home or wherever), it seems clear that for companies in the high-skill knowledge sector, working from home is the solution of choice during the BART strike. Even if it isn’t the right answer forever (because it makes it harder to collaborate or harder to build a positive organizational culture, or for any of the other reasons that people still go to work), at many workplaces, employees will be able to work from home for as long as the strike lasts. Firms that have created systems to make remote work seamless are reaping the benefits right now. When you can’t get around the region, can the rest of your life continue? Like employers, households and neighborhoods also need transportation resiliency. While most activities are becoming more regional, BART’s closure is a reminder that having one’s life close to home is highly valuable. Schools, child care, health care, retailers and public services that are within walking or biking distance from home allow for interruptions to be minimized when problems arise on the regional transportation network. Keeping life “close to home” will be increasingly important as our region’s population ages. The barriers to this are sometimes social — a preference for a faraway school or health provider — but some of the barriers are created by the market and the way we plan. A challenge for our local resiliency is to protect local transportation networks from failures in the regional transportation network. It will be difficult to protect downtown San Francisco or downtown Oakland from gridlock when the interstates that run through those cities are at a standstill. Bay Bridge use restrictions: Similar to the requirements that New York City put into effect in Lower Manhattan after September 11, 2001,the bridge could be restricted to occupancy of not less than four people per vehicle. In addition, contraflow lanes should be established on the lower deck for buses entering the city in the morning. Additional bus service: BART carries more than 20,000 people per hour across the bay during the morning peak. Many of these trips could be absorbed by express buses. An increase of 10,000 bus passengers hourly would require about 200 additional buses (assuming that most buses could do a round trip in one hour from the East Bay). In the future, the new Transbay Transit Center can accommodate this demand. This would require an emergency reserve fleet, managed by AC Transit or other transit operators, stored in the East Bay. HOV restrictions: Caltrans could increase all high occupancy vehicle occupancy requirements on highways 880, 580, 101 and 280 to not less than four per vehicle, to ensure that express buses can operate effectively. In addition, carpool lanes should be extended through all approaches to and from San Francisco on Highways 101 and 880. In addition, meter facilities should allow only vehicles with at least four passengers to bypass them. Bridge access: Caltrans could designate special bus-only access to the Bay Bridge from locations such as West Grand Avenue. Peninsula and East Bay park-and-ride locations: In addition to using Caltrain and BART stations, cities could provide additional locations as park-and-ride areas for express buses operating into San Francisco. The BART strike begs a larger conversation about the financial future of our regional transit network. We have not fully funded operating or capital costs for our transit operators — either to maintain what we already have or to grow as our population grows. Transit operator costs are driven by the costs of people: Wages and benefits make up about 75 percent of the costs for Bay Area transit operators. As is true across the country, the skyrocketing cost of health care for transit workers continues to eat into salary increases and other benefits. The negotiations between BART and its unions, and the impacts of the strike, also highlight the increasing strains on middle-class workers in the Bay Area: transportation and housing strains, cost of living strains, education strains. The urgent need to stabilize our public transit agencies forces unpopular and difficult decisions about where to spend money. We can work together and work creatively to correct our course and get transit on a path where transit agencies and their services are more financially stable — but it isn’t going to be easy, as we are learning this week. SPUR promotes the Central Subway, BART to the San Jose Flea Market, and whatever the hell their donors decide need to be built. The rest (200 bus reserve fleet! Transportation Resiliency! We Need More Communication!) is worth exactly as much as you pay for it. All sorts of TOD nonsense talk, and groovy platitudes about Substainability and Balance and Urbanism and Good Government and LEED Silver Rating and Resilience and Complete Communities and Workforce Housing and Whatever You Say Willie, but in the end it’s all about whatever makes the construction companies happy. And that sure as hell isn’t what makes transit work better. Follow the money. On carpools, we need congestion pricing for leaving San Francisco on weekday evenings to financially incentivize carpooling between 3pm and 7pm via a discount or free pass for car poolers leaving downtown. We saw this past week that it was a breeze to get a car pool ride into the City, but much tougher to get a ride back to the East Bay. KQED was really vibing on a listeners quip (I heard it twice) about how nice it would be if the Transbay Tube was open to cyclists and pedestrians because he saw an old photo of such activity from just before it opened. They did not however, mention the obvious idea of giving over a little bridge space to those users. Don’t know if this is realistic or not, but just as a thought about redundancy: you can’t have ferries sitting around unused, but what if you had barges outfitted for carrying people? Then, when needed, you hook up push tugs and start moving people. Good thoughtful article. Wish that Bay Bridge bike lane existed. My folks that live in the East Bay would use it. that a service will be provided for them. One thing about transit strikes is that they force us to realize that the city is not a smoothly functioning machine, but a very political space involving much conflict and great inequalities. In which we ourselves play a part, and which forms the context for our choices and their consequences. Such an insight is a needed step toward thinking more like citizens than like “get me there now” consumers. ≈ Gee whiz, cars are dynamic and flexible now that they can be summoned with cellphone apps! Um, is there any evidence that this starry-eyed Lesson had any measurable impact on this week’s transportation mix, or is the “revolution” in the realm of marketing? One app-based venture with save-the-world marketing copy all over their website showed its commitment to the planet with a gas-guzzling helicopter commute gimmick. Seems to me that an organization dedicated to transit, walking, and biking would at least mention that the Key System over the Bay Bridge had more carrying capacity than the current cars-only setup and BART tunnel combined. The vision going forward should look thataway. The very basis of environmentally responsible and sustainable urbanity–car-free living and transit-oriented development–is undermined when critical transit systems arbitrarily shut down for days at a time because a couple thousand people aren’t getting all they want from their employer. As for the magical thinking that strikes like this “force us to realize” how we deserve to feel insecure about taking public transit because the contentious inequality machine is politicized and class-conflicted and whatnot–no. In the real world, strikes this disruptive alienate the public from unions and from the very concept that relying on public transit is a good idea. Bring back the Key System! right. The “haves” (i.e., Muni and BART drivers) vs. the “have-nots” (the normally paid/non-public union sector workers). yeah, if but nothing else, but an insurance policy that if BART unions threaten to strike in the future, the consequence will be mass layoffs. The only reason we would need to add any additional BART or road capacity is because of pro-growth organizations like ABAG and SPUR. If development was restrained to SF, OAK, UCB, SJ, MV, & PA, then the only transit improvements we would need over the next century would be undergrounding roadways and subways in the cities, while converting sprawling suburbia back into parkland or farmland. That said, the population of SF could double or even quadruple without any effect on crowding, and resulting in a higher standard of living for residents (if done right). I can say that it is nearly impossible to have a transit agency to keep a 200 reserve bus fleet for an event that happens once in 15 years. A strike of that scale require private sector involvement which have a better chance for quick mobilization. During the strike I ran shuttle service between Downtown Oakland and Transbay every 40 minutes to pick up people who got left behind by AC Transit’s NL line (with people paying cash fare). Most of the customers are transit dependent that need to get to work midday when BART ran frequent train service. There’s no need for fancy apps and any of the dynamic stuff. I think BART should’ve mobilized more non traditional private operated transportation to fill some of the gaps. It could subsidize free rides on taxis or airport vans traveling between BART stations that aren’t served by buses (like Rockridge and Orinda, Castro Valley and Dublin, etc). There should’ve been regional cab stands where Oakland and other East Bay cabs can pick up transbay riders in SF and vice versa. I think the whole dynamic/casual ridesharing is overrated. People like BART (and transit in general) because they can get into a routine, which you can’t get with casual rideshare. Since auto-ownership is pretty common, people would rather drive and give rides rather than getting rides, which explains why casual carpool drivers were having a hard time picking up people at BART stations. How is that “transit first” policy working out for you this week San Francisco? 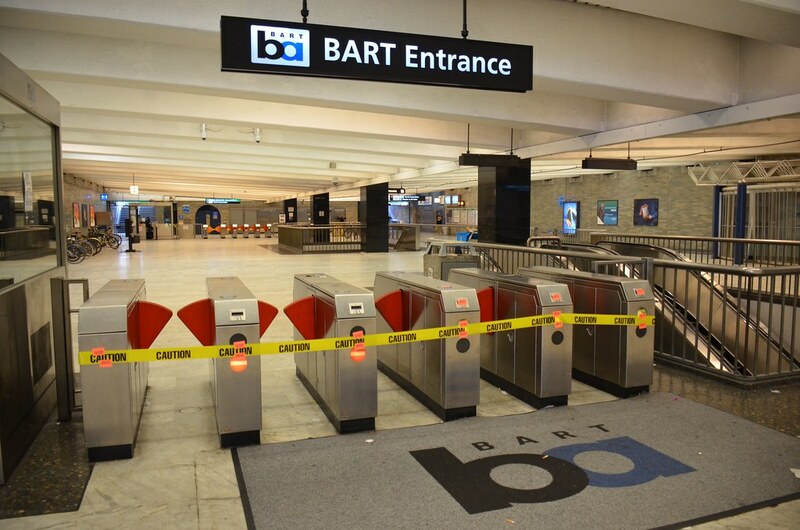 What are the lessons learned from the BART strike? 1. The city cannot count on public transit to be there when we need it. 3. If BART, CalTrain, or GG Transit fails the entire city will grind to a halt. Public transit, served its own needs before it served the needs of the transit riding public. The Millions of dollars that are being wasted on creating “Walkable” and “Bike Friendly” streets have not done nothing to help the hundreds of thousands of commuters who cross the bridges and tunnels every day. The “car free” special interest groups who have been pushing City Hall to close Market street to cars and remove roadway space for auto traffic only added to the downtown gridlock and traffic congestion during the BART strike. The vast majority of commuters got into the city by carpooling in private cars during the BART strike. Public transit makes us all dependent on Government, Unions, and a failed Transit First policy. The BART strike should be a wake up call to the Mayor and the Board of Supervisors that “transit first” does not mean transit only. Building an urban plan around a “transit first” policy is writing a blank check to the unions. More specifically, I’m talking about the potential for an ideal of transport redundancy to slide into transport stratification. For example, Uber (the “taxi for the 1%”) and similar automobile-centered services are being heralded here among the “solutions” to fixed-route (unionized) mass transit. I’m sure that’s not the main thrust of what the authors intend, but it is something to be wary of. Will we soon see the end of transit tickets?